Do you have a recipe that you love to make, and your family loves to eat it, and you just assume that everyone else out there makes it too, because it's just that good and easy? Well, roasted veggies is one of those recipes for me. And just in case you all don't already make this awesome recipe or something similar, I wanted to get it up on my blog. I know that if I take the time to roast veggies for dinner, my family will gobble them up. The flavor is just that good! Plus, it's just an awesome way to clean out your fridge! 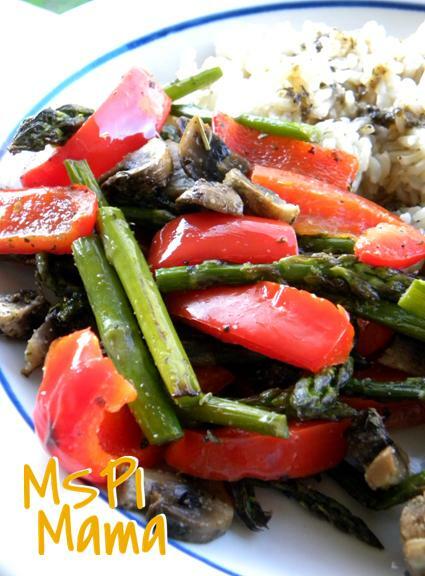 I've used asparagus, red pepper and mushrooms in this recipe, but you can easily adjust it to whatever you like. Broccoli, cauliflower, onions, carrots, etc. all roast well. Just keep in mind that harder vegetables, such as carrots, should probably be sliced thinner than the softer vegetables since they take longer to cook. Preheat oven to 450 degrees. Toss the vegetables together in a large bowl. Drizzle with the olive oil and sprinkle with the herbs, spices, salt and pepper. Toss. Spread the vegetables out in a single layer on a large baking pan. Roast in the oven until the vegetables are tender, about 15 minutes. Adjust seasoning, as needed, to taste. Note: I like to use a healthy sprinkle of garlic powder and Italian seasoning when I roast vegetables, however, you can adapt this recipe to whatever you like or have on hand. Plain Jane? Salt and pepper will work just fine. Feeling spicy? Add a pinch of red pepper flakes. There are a lot of flavors you can try. Rosemary, thyme, basil, oregano, cumin, etc. Not to mention, there are lots of spice mixtures available at the store that you can try. Have fun with it! We usually go plain jane too! But you're right! So delicious! And oddly enough - I know lots of people who ask for my recipe for my roasted veggies... So, its not a staple at EVERYONE'S house - but it should be!!! I'm excited to try it your way with some Italian seasoning and Garlic Powder! What a great way to mix it up!